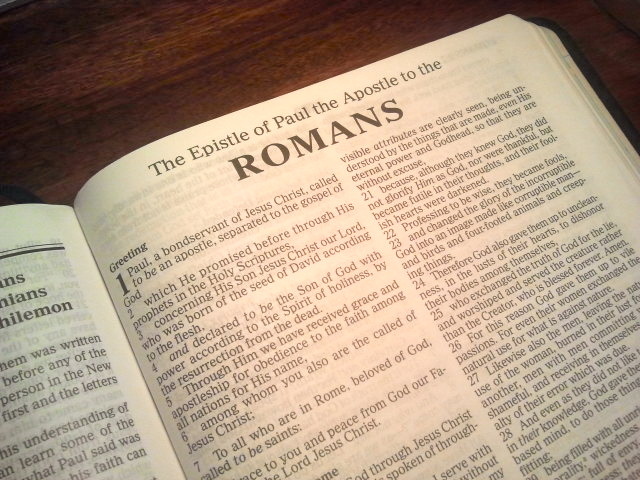 The Book of Romans is the “mountain peak” of the Apostle Paul’s inspired Writings. This great Book demonstrates the Power of God over sin and the astonishing efficacy of His Grace. Romans is Paul’s triumphant exposition about the truly amazing Grace of our Lord and Savior Jesus Christ. It is through Romans that we learn about the sinfulness of sin and the Righteousness of God. We learn about the wrath of God revealed from Heaven against all sin. Paul writes about the extreme penalty for sin for all members of the human race and the extreme payment for sin by God’s Son, Jesus Christ. It is in Romans that we see the horror of sin and the honor of the sinless Sacrifice of Jesus on the Cross. God is the Judge of sin. Jesus is the Propitiation for that sin. We learn through Romans that God frees sinning slaves to become forgiven saints. God is Sovereign in all the universe and the Source of all Truth. Romans has been studied and loved by millions of people for almost 2,000 years. Here is what some of those people have written about Romans through the centuries. To me, once a mocking atheist, the Book of Romans is a “soul feast” – dining on the most pure and perfect doctrinal delights. The man who led me to the doorway of God’s forgiveness through the great Sacrifice of His Son Jesus Christ quoted from Romans as he explained the great Gospel of God. I learned from God through the writings of the Apostle Paul that I was hopelessly lost and desperately in need of salvation. I, like all other people on earth, was a sinner. I had sinned and fallen short of God’s glory. The Holy Spirit did His Work of convicting me of my sin, so I was ready to hear the Gospel of God. I was convicted and convinced by the Gospel of God, so I repented of my sin and asked for God’s forgiveness. I believed on the Lord Jesus Christ, was justified and redeemed, and received the righteousness of God. God passed over all the sins I had previously committed because of the shed Blood of Jesus Christ. God demonstrated His Righteousness to me and proved Himself to be “just and the justifier of the one who has faith in Jesus.” Praise God and Amen! I am excited to share with you what God reveals about Himself and His Gospel in the Book of Romans. We are embarking on the most amazing journey together as we see sin and death, mercy and grace, love and forgiveness, and truth and life through the eyes of the Almighty God. I’m excited that you are going through Romans. It is one of my favorite books of the Bible also. Thank you! You’re welcome, Eric! I’m excited to go through Romans verse by verse. I taught through it many years ago and it was such a blessing. Time to do it again!